The most hassle-free way of feeding your marketing data into BI tools and data warehouse. Built by marketers, for marketers. No programming skills needed. Best-in-class integrations with Google Analytics, Google Ads, Facebook, Bing, LinkedIn and other marketing platforms you use. Have full control of your data. Never worry about losing historical data again. Fetch your data in lightning speed. Superior scalability & reliability compared to spreadsheets. Get over the cell, row or speed limitations of spreadsheets. A more robust way of getting your data. Build API queries as if using our Sheets add-on. An intuitive self-service query builder mirroring the Supermetrics for Google Sheets sidebar experience. Connect to any Supermetrics data source with an easy-to-use interface. With just a few clicks, feed any marketing data directly into data warehouse or BI tools. Voila, your data is there. Use it in any way you want! 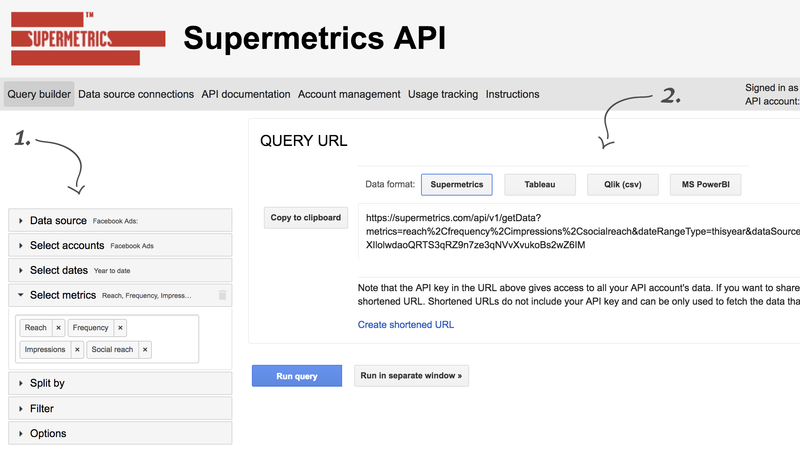 Get started with Supermetrics API. Get your data flow running in minutes.